In our last post, we discussed two key obstacles to bringing virtual reality (VR) action gaming to the mass market, namely rotational latency and positional disjunction. While the first issue can be resolved through technology that has faster and better displays, a completely different approach is required to solve the problem of positional disjunction. 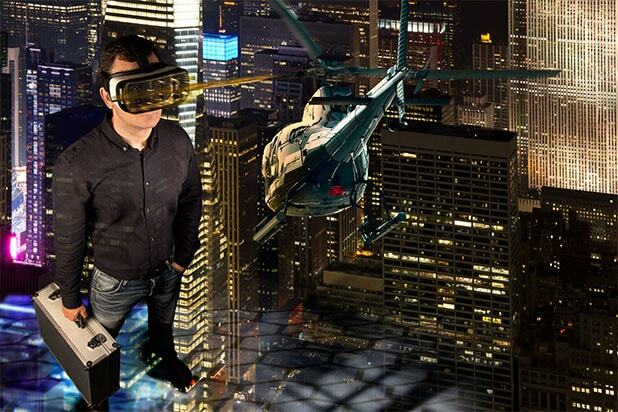 The answer lies in changing the VR gaming paradigm and allowing people to move as they play. As we have previously discussed, nausea occurs when our eyes register significant changes in position while our inner ear tells us that we are stationary. But when we are allowed to move and dodge in a room the size of a basketball court, the problem is solved. Most of us have seen this idea played out in “Star Trek: The Next Generation,” when Worf uses a 3D simulation room, the holodeck, to practice his fighting tactics. And we can now simulate holodeck combat with VR headsets in a large room. 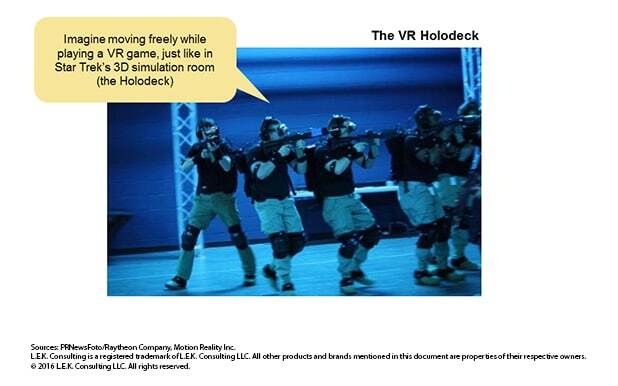 Here are three companies that are making the holodeck a reality: Void, Zero Latency and VRcade. Void is developing a 25,000-plus-square-foot VR theme park in Utah and, in partnership with Sony Pictures, a VR attraction in Times Square that is said to be opening in a few weeks. Prices for VR sessions are approximately $30 for 30 minutes. Take a look at this two-minute video, which has already gotten 4 million views. Zero Latency is developing a 4,300-square-foot, mid-scale VR theme park that is located in a warehouse. The company has partnered with Alienware to use its Alpha PC gaming console to power Zero Latency’s backpack computers (for rendering) and Oculus Rift DK2. The game is priced at approximately $88 for a 45-50 minute session. For free-roaming, multiplayer VR action see this one minute video. 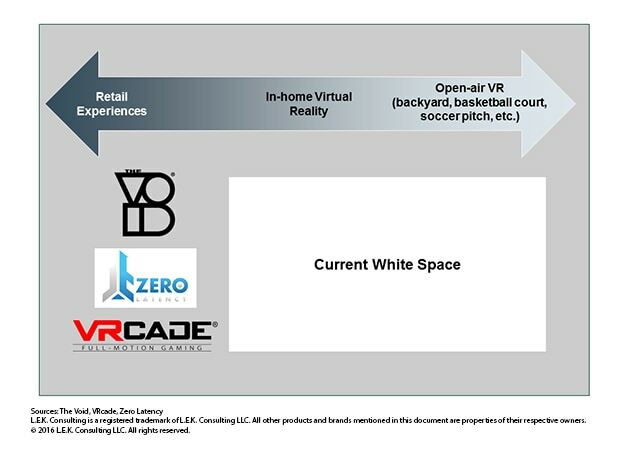 VRcade is developing a small-format (225 square feet) VR arcade experience in partnership with Dave & Buster’s (rates are around $5 for five minutes). However, all of these companies have focused on retail experiences, and there remains a significant white space in in-home and open-air VR, which could drive significant mass-market consumer adoption. Substantial opportunity exists for these startups and also for large game publishers and hardware companies. VR will need to use off-the-shelf hardware and probably some off-the-shelf modifiable games (e.g., “Counter-Strike,” “Skyrim,” “Fallout” or “Halo”). Players will need to wear backpack processors to handle latency issues because cloud-only processing does not allow games to move quickly enough. The holodecks and wearable devices will need numerous sensors to report the positions of players in real time, including sensors on bodies and weapons (or perhaps Kinect-type viewers for positions) and sensors to mark the limits of game areas. Free-movement VR software will need some good hacks to address the differences between VR gaming and traditional console or PC gaming. For example, in traditional games, the player aims the reticle, and the gun follows the motion; however, in VR, the player needs to point the gun and the reticle needs to follow. Free-movement VR needs a large software publisher to ensure that content is refreshed frequently, and big publisher names would drive adoption. Whoever is first to mass-market free-motion VR will be known as the pioneer in the realm of free-motion VR. There is a “coolness” factor associated with VR that will rub off on the developer (just as the pioneering open-world gaming of “Grand Theft Auto” made Take-Two cool). There is the possibility of selling a large number of units (primarily software, but hardware royalties are possible, as well). Short-term opportunity is in closed retail locations for group play, but improvements in technology will allow for larger markets in homes, backyards, soccer fields, basketball courts, etc. Free-motion gaming is the key to the mass adoption of VR for the action gamer: It is certain to earn major profits for the first companies that make it work. This is Part 5 in a series on virtual reality trends by Dan Schechter, Gil Moran and Francesco Di Ianni from L.E.K. Consulting’s Media & Entertainment consulting practice. The PC has all the games, from blockbusters to the most obscure art titles. 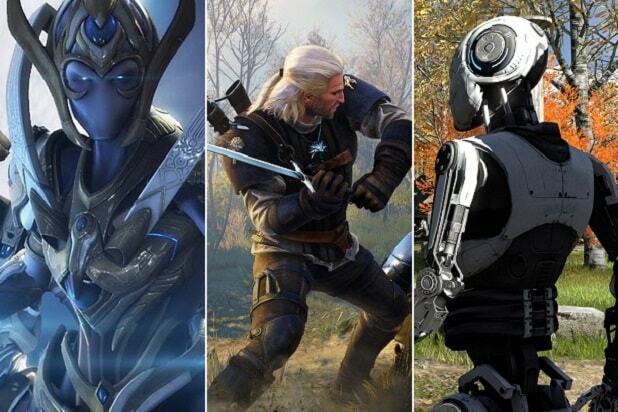 We're here to help you sort through the crowded marketplace, with a regularly updated list of the best games for the longest running game platform around. This independent game has a simple premise: you run a border checkpoint in a fictional communist Eastern Bloc country, and you must check everybody's papers to make sure nobody gets through illegally. Make a mistake and your meager pay is docked and your family suffers. As it goes on, some moral conundrums will arise, and your desire to "win" will be tested. "Papers, Please" is a great use of the gaming as a means of expression. It's a game about taking the crew of a small starship on a journey across the stars as an enemy fleet gives chase. Failure is permanent, and death really is the end -- and you're as likely to get done in by a bad choice in a seemingly benign situation as you are to get murdered by the bad guys. "FTL" is as tense as games get. It may not look like much, with the sort of visuals you'd expect from a mid-90s game rather than one that came out in 2015. And its premise is certainly worn out -- here we have yet another game about exploring a derelict spaceship. But "Spirits of Xanadu" is much greater than either of those things would imply, utilizing legitimate economy in its storytelling. "Xanadu" demonstrated that how game developers use the resources they have matters more in making a great game than simply having a lot of resources. This is a bit of a cheat, as "StarCraft 2" is technically a trilogy of games, "Wings of Liberty," "Heart of the Swarm" and "Legacy of the Void," each of which you have to buy separately. But it's still the strategy game of strategy games on a platform that's full of them. It's great to play and tells a really compelling story, a rarity for this genre. In "Talos," a robot is put through a series of intelligence tests to see if it has what it takes to be a person. These tasks are handed down by a voice in the sky that refers to itself as Elohim, and the hook is that you're one of many robots being put through the paces -- because this world is in a computer built by the last living humans, and these tests are intended to create a successor race. Not just the best "Call of Duty," but the first-person shooter of the 21st century. For a franchise that snobbish gamers like to write off for being blustery, "Black Ops 2" manages to be wildly inventive in how it tells its story, using seamless story branching that hinges more on failure or success in key moments than on intentionally making a decision. If you didn't know "Black Ops 2" had a branching plot structure, in fact, you might play all the way through it without realizing what it's doing. That "Black Ops 2" is also the reigning best multiplayer shooter is just a bonus. It's not the scariest game ever made, but it sure puts you on edge. You wander an old space station infested with alien xenomorphs you aren't able to kill. You can't fight them, so you have to outsmart them -- a tall task since these xenos are as intelligent as any digital foe we've encountered before. Some of the best video games are those that are so good nobody else has been able to really copy them, and the "Portal" series is the poster child for that. "Portal 2," released in 2011, is both hilarious and mindbending -- a puzzle experience worth revisiting over and over. BioWare made a mistake in trying to meld its signature brand of storytelling with the sort of online game experience popularized by "World of Warcraft." But in the years since it first hit the market in 2011, "The Old Republic" has slowly morphed into a pretty good approximation of what we want from a BioWare. That's lucky for us, because it contains the best "Star Wars" stories of the 2010s. As the title would suggest, "Parnormal" is an attempt to adapt the template of the "Paranormal Activity" films into game from, and it works pretty well. Though it's little more than a randomized haunted house simulator, "Paranormal" is scarier than nearly any other game that's come out in the last few years. "Star Wars: Knights of the Old Republic 2: The Sith Lords"
The pinnacle of the old "Star Wars" Expanded Universe, "Knights of the Old Republic 2" is a deconstruction of the world's most popular entertainment franchise. "KOTOR 2" has no respect for the way you think "Star Wars" works, putting you in the role of a Jedi under the tutelage of a master who offers every lesson as a riddle for which there is no correct answer. For "Star Wars," a dip into nihilism is refreshing, and "KOTOR 2" is refreshing as hell. A lot of creators of role-playing games tout their freedom of choice and branching stories, but it's nearly always an illusion. In the spy thriller "Alpha Protocol" it's still an illusion, but it's far more complex than what we're used to. It's also short enough to play through a bunch of times to try out all the different possibilities, something that can't be said about most other branching plot RPGs. The PC has as large a selection of video games as one can imagine. Which ones are most worth your cash — and time?